Time to sell your Lagoon Tower condo? Read about today's resort-market condo buyer. 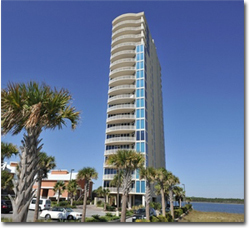 Lagoon Tower is located in the West Beach area of Gulf Shores, Alabama. The low-density complex only has 32 units and offers expansive views in all directions. The building is only one of a few that sit on the narrow stretch of West Beach, which means it's very close to the Gulf of Mexico with deeded beach access for guests and owners. The condo has high-end finishes and only two units per floor. The condo also has a fishing pier with first come, first serve boat slips. There is an entrance to the Gulf of Mexico nearby at West Pass for smaller craft like jet skis. Lagoon Tower is a great choice for either a permanent residence, vacation home, or used for investment purposes. Lagoon Tower is near popular lagoon front developments Mustique, Gulf Shores Surf & Racquet Club, and Sea Oats. Use our search features and interactive maps to find similar condos in nearby communities such Orange Beach and Perdido Key FL. If you would like to schedule a private viewing, need more info on Lagoon Tower, or other Gulf Shores condos, or have questions, please email info@condoinvestment.com or call (251) Area-Pro (251-273-2776) for immediate assistance. Find ways to increase your Lagoon Tower rental revenue with our RENTAL TIPS. Find annual rental incomes for Lagoon Tower and all other condos using our Alabama Gulf Coast Condo Revenues page.